With jalada Fractual, you will be introduced to the mysterious world of fractal geometry. Fractal geometry is one of the most exciting areas of math. Its images are stunning in their beauty and complexity, yet they are made from simple rules. They display a universality and resemblance to nature that will shake even the most fervent of math unbelievers. jalada Fractual is your gate to this fantastic world. It generates color images of the most popular fractal - the Mandelbrot set - and also generates images of the associated Julia sets. 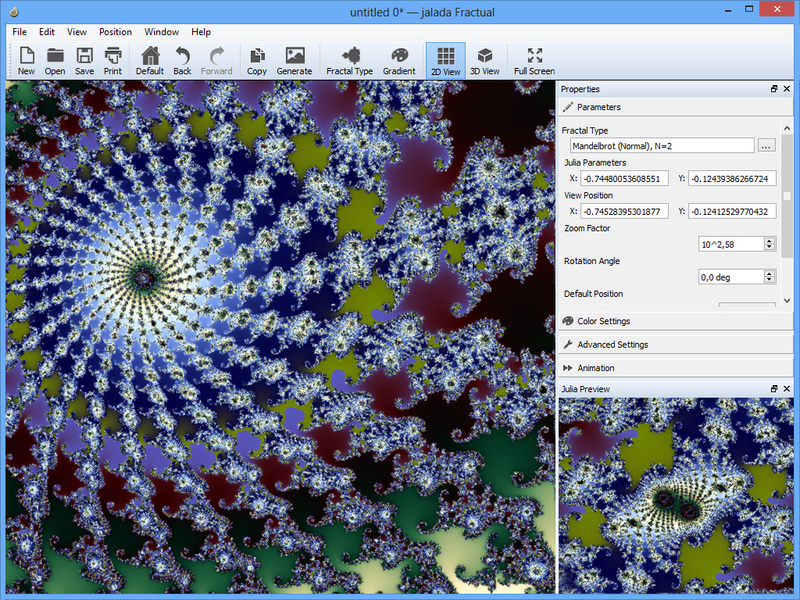 jalada Fractual has several options for producing striking variations of fractal images, and includes advanced features for producing high-quality images. With jalada Fractual, you\'ll be able to see for yourself what a fractal is and how it is created. Whether you are a first-time fractal adventurer or have a Ph.D. in Mathematics, we invite you to join this exploration. Planetsofts.com didn't scan Jalada Fractual For Windows for viruses adware, spyware, or other badware. For safety reasons, we recommend that you always keep an updated antivirus installed on your pc when downloading and installing software from the web.